Good stories persist. This is why I can still read "Where the Wild Things Are" to my children thirty years after my father read it to me. And good stories, what one might call living stories, are adaptable. They are able to conform to the times, change with the setting, and thus live to speak anew another day. One such story is the combat myth. Most ancient Mediterrannean cultures possessed a version of this story which deals with combat between the forces of good and those of evil (typically represented by a dragon). One Greek version of the combat myth is the Apollo-Leto story. Leto is a pregnant woman about to give birth to the god Apollo. Python, a dragon, learns of a prophecy that Apollo will grow up to destroy him. So Python, the dragon, pursues the woman to kill her and the child, but Zeus intervenes and rescues the woman. She gives birth to the child who then defeats the dragon. This was a popular story, told and retold in the literature of the time, depicted on vases and coins and through sculpture. In short, one could say it was part of the popular culture of the day. We find a version of this story in Scripture as well -- Revelation 12. A pregnant woman is pursued by a dragon who wants to kill the woman and her child because it knows that the child will grow up to defeat it. But God intervenes and rescues the woman, and the child grows up and defeats the dragon (Rev. 12:1-11). John here takes the story of Christ (the child) and retells it in the form of a popular story from the culture as a way of getting his audience to hear the story of Christ in a new way. Paul does much the same thing when he relates the story of God's involvement with his creation by reciting Greek poetry about Zeus (Acts 17:28). We encounter this story anew today as well, with a little help from Arnold Schwarzenegger. 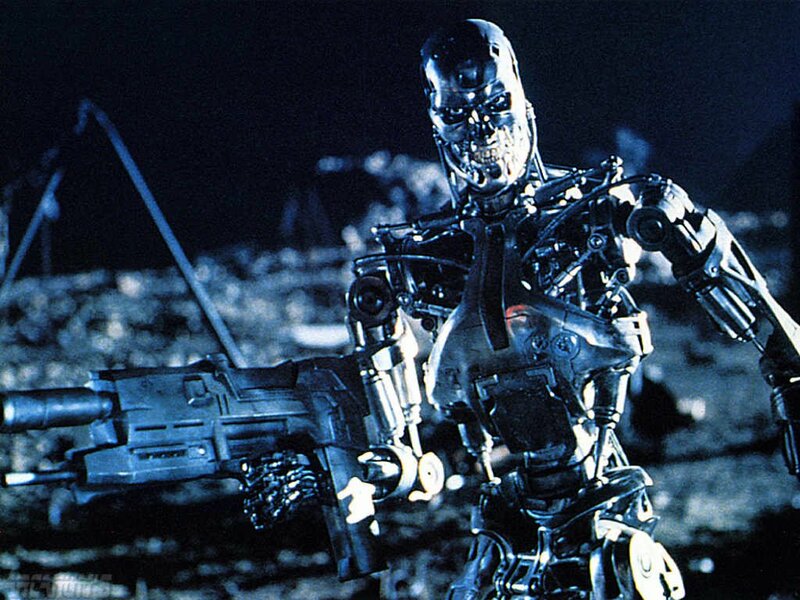 The Terminator is simply a modern version of the ancient combat myth. In the place of a dragon, we meet a "terminator." 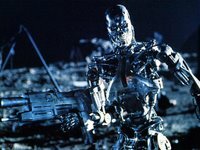 If you are familiar with Revelation 12, the story of The Terminator should be a familiar one: A pregnant woman is pursued by a destructive creature from outside our world because it knows that the child is fated to destroy the machines who will one day take over the world. But as the terminator pursues the pregnant woman, another from outside our world intervenes and rescues the woman so that the child can live to fulfill his destiny. Isn't the story of King Herod trying to kill all of the two year old males or even Pharoh killing all of the two year old males the same? Or is this different because the children were out of the womb already? Well, it is interesting that there are some texts in Ezekiel that symbolically describe the Egyptian pharaoh as a dragon.